A sharp decline in the West sent New Home Sales lower by 1.5 percent in March. Across the country, sales in the East were unchanged while sales rose in the Midwest and South. The Commerce Department reported that March New Home sales fell from February to an annual rate of 511,000, below the 521,000 expected. Sales were up 5.4 percent, however, from March 2015 to March 2016. 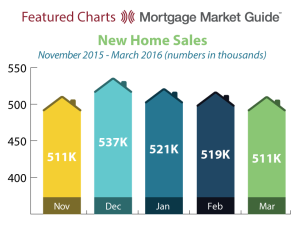 The New Home Sales report shows the number of newly constructed homes with a committed sale during the month.